A memorable remark! Of course by repeating it I have let the cat, so carefully hidden, out of its bag, or at least revealed the whiskers. But we won’t bother about that for a moment. Just consider the splendour of the words! ‘I shall express the accusative case.’ Magnificent! Not ‘it is expressed’, nor even the more shambling ‘it is sometimes expressed’, nor the grim ‘you must learn how it is expressed’. What a pondering of alternatives within one’s choice before the final decision in favour of the daring and unusual prefix, so personal, so attractive; the final solution of some element in a design that had hitherto proved refractory. Here were no base considerations of the ‘practical’, the easiest for the ‘modern mind’, or for the million – only a question of taste, a satisfaction of a personal pleasure, a private sense of fitness. As he said his words the little man’s smile was full of a great delight, as of a poet or painter seeing suddenly the solution of a hitherto clumsy passage. Yet he proved as close as an oyster. I never gathered any further details of his secret grammar; and military arrangements soon separated us never to meet again (up to now at any rate). But I gathered that this queer creature – ever afterwards a little bashful after inadvertently revealing his secret – cheered and comforted himself in the tedium and squalors of ‘training under canvas’ by composing a language, a personal system and symphony that no else was to study or to hear. Whether he did this in his head (as only the great masters can), or on paper, I never knew. It is incidentally one of the attractions of this hobby that it needs so little apparatus! How far he ever proceeded in his composition, I never heard. Probably he was blown to bits in the very moment of deciding upon some ravishing method of indicating the subjunctive. Wars are not favourable to delicate pleasures. 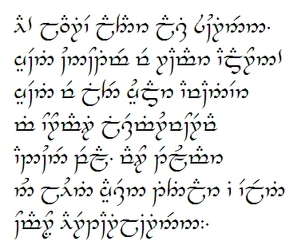 when I say that my long book [The Lord of the Rings] is an attempt to create a world in which a form of language agreeable to my personal aesthetic might seem real. But it is true. An enquirer (among many) asked what the L.R. was all about, and whether it was an allegory. And I said it was an effort to create a situation in which a common greeting would be elen si-‘la lu-‘menn omentielmo [‘A star shines on the hour of our meeting’], and that the phrase long antedated the book. The languages came first, insisting on existence; the stories came later, and gave them a home. In the Land of Invented Languages is a wonderful book about constructed languages and the people behind them, their dedication, obsession, and extraordinary creativity. On the website you can read excerpts and browse an archive of 500 invented languages, from Hildegard von Bingen’s Lingua Ignota (ca. 1150) to some of the many conlangs in active development. J. R. R. Tolkien, A Secret Vice (PDF, 1.02 MB). Resources for Tolkienian Linguistics: An Annotated Guide. Update: Language Hat continues the discussion about Tolkien and conlanging. He also wrote a terrific review of Okrent’s book, which should persuade you to read it if you haven’t already and have even a passing interest in the subject. This entry was posted on Tuesday, May 24th, 2011 at 7:54 pm and is filed under books, conlangs, etymology, language, language history, linguistics, stories. You can follow any responses to this entry through the RSS 2.0 feed. You can leave a response, or trackback from your own site. Tolkien linguistics, as I know to my cost (I moderated the Elfling list for one of the more difficult 18-month periods of my life), is a field in which the more learned the scholar, the more cranky and difficult they tend to be. You’ve linked to a useful but one-sided resource, so I’ll link to another: Ardalambion. Jams: It’s an intensely busy but very niche area. Apart from a link here and there, the only time I’ve written about them before was this post on Na’vi. John: I hope that, difficulties aside, it was a worthwhile experience in some ways. Thank you for the website; I linked to one of its pages in par. 3, and will explore further when I can. It was educational, but so was falling and breaking my toe: it told me to be careful about falling again. Otherwise, not. Still, I was providing a public service, and virtue is its own reward, which is good, because other rewards aren’t very likely in this case. I think, Lewis Carrol was also a conlanger. A: Carroll certainly coined a lot of vocabulary, much of it glorious nonsense, but I wouldn’t say he invented languages. It depends, I suppose, on how you define the terms. That was a great read. I look forward to reading more of your stuff in future. Glad you enjoyed it, Tolkien. You can subscribe to the blog by email or RSS, if you wish.